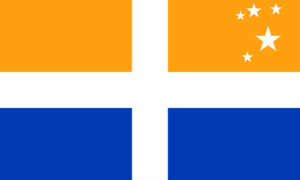 Depending on how you measure and define things, the longest war in human history may very well have been between the Netherlands and a tiny collection of islands 28 miles off the coast of Britain known as the Isles of Scilly (the flag of which is pictured below) . The “war” lasted for three hundred and thirty five years and consisted of zero battles. It was a “war” only in the sense that the Netherlands had made a declaration of war in the 1600s, and then simply forgot to rescind it. In 1986 a historian on Scilly set out to debunk what he thought was a local legend but, instead, ended up confirming that, yes, his small island community was technically still at war with the Netherlands. The historian alerted the relevant authorities, the Dutch ambassador visited the isles, read a scroll aloud, and declared peace. After 335 years of “war,” one of the longest declared military conflicts ended without the loss of a single human life.